There were plenty of spills and thrills on the North face of Aiguille Pourrie creating a dramatic background to the competition. Competitors were treated to perfect weather with a cloudless sky and soft snow conditions. 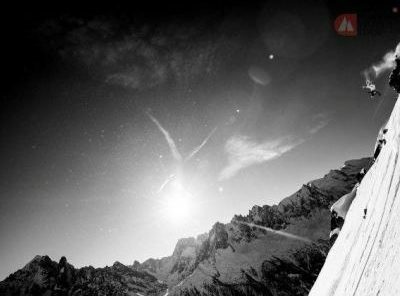 Chamonix is the third stop of six spectacular destinations so marks the halfway point of the 2013 Freeride World Tour season the pressure was on for riders to perform their best in pursuit of the first ever true world champion title. The first win of the day went to non other than Chamonix local Jonathan Charlet in the mens snowboarding. The current leader on the scoreboard took out the men’s skiing field with a dynamite run was The North Face athlete Drew Tabke of Crystal Mountain, Washington, USA. He charged out of the starting gate and straight down the fall line and maintained incredible speed as he launched off a huge cliff at the end of the technical section of the venue. He certainly didn’t disapoint, he wowed the crowd with an impressive rotation at the end of his run. Also at the top of the scoreboard for Womens Skiing is Christine Hargin of Ramundberget, Sweden who managed back-to-back wins after taking the win on Saturday. She already holds the Revelstoke title. She skied a very fast run with a nice air at the top demonstrating how strong a skier she really is, a force to be reckoned with. Laura Dewey pulled one out of the bag when she shredded her way to victory on borrowed equipment due to lost luggage. She managed ride really clean and solid and link many features together throughout the venue.